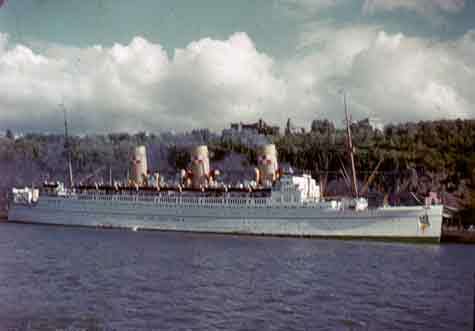 The CPR Empress of Scotland docked in Quebec City circa 1951. Among the slides taken on Annie Shill's trip to Europe that year. From the arrival by ship of the first Europeans to North America, immigrants and visitors traveled long distances across the Atlantic to take advantage of the rich resources to be found on the “new” continent. For centuries wooden sailing ships ruled the waves. To see which family members traveled on which ship, click here. Whenever talking about travel by ship to Montreal, it must be remembered that Montreal and Quebec City were only accessible during the summer season. Ships in the winter were obliged to stop at ice-free ports such as Portland, Maine; St. John, New Brunswick or Halifax, Nova Scotia. Prior to 1856, travelers headed to or through Montreal might have come by ships which sailed when demand warranted. Or, they might have landed in Quebec City and continued upriver by steamboat, a service which had been in effect since before 1820. Montreal Ocean Steamship Company, also known as the Allan Line, was a major shipping line based in Montreal. The “Canadian” government granted the company the Atlantic mail contract in 1855. The following year, the Allan Royal Mail Line started regularly scheduled sailings every two weeks between Liverpool and Quebec City and Montreal. In 1861, Allan Line inaugurated the first scheduled steamship service between Montreal and Glasgow. At the time the Canadian Pacific Railway (CPR) was incorporated in 1881, Allan Line’s ship the Parisian was crossing the Atlantic in 8-9 days at a speed of 14 knots. By 1891 Allan Line was serving Quebec City and Montreal from Liverpool, Glasgow (both weekly) and London (fortnightly). Since 1884, even before the cross-Canada rail line had been completed, CPR had made arrangements for the Beaver Line, the Donaldson Line, Great Western, Thompson and Ross Lines to carry traffic connecting to or from the rail line between Canada and UK ports. While CPR Steamship Services started operating its own ships, the “Empresses”, on their Pacific routes in 1891, it wouldn’t be until 1903 that the company would purchase and operate its own fleet on the Atlantic route to the United Kingdom. The CPR purchased the Elder Dempster (Beaver) Line ships in February of 1903 and the Montreal Gazette declared “This action of the CPR should have a good effect on the trade of the St. Lawrence and of Montreal.” These first ships had a speed of 12-13 knots. Canadian Pacific chose Halifax as their primary ice-free Canadian port. In winter, passengers transferred to railways to their inland destinations. Passengers traveling to Montreal would be routed via the Intercolonial Railway (I.C.R.). During the summer months, ships stopped in Quebec and Montreal as well. CPR’s first crossing was made by the Lake Champlain which arrived in Montreal April 26, 1903 after being delayed in Halifax due to weather. That year between the Lake Champlain, Lake Erie and Lake Manitoba 33 sailings from Liverpool to Montreal were made, carrying a total of 23,400 third class passengers, the majority immigrants to Canada. In 1904, CPR began sailings from London and Antwerp to Montreal. Between 1904 and 1913, 188,000 emigrants were carried to Canada in third class on this route. The same year, CPR ordered two 18-knot liners, the Empress of Britain and the Empress of Ireland. Both ships came into service in 1906 on the Liverpool to Quebec run. A year earlier, in 1905, the Allan Line had used the first steamer ships with turbine engines on the North Atlantic: the Victorian and the Virginian which also traveled at a speed of 18 knots. After dominating Montreal’s shipping business for most of the 1800s, the Allan Line was purchased confidentially by the CPR in 1909 and the companies continued to operate as if they were still rivals. An article in the Montreal Gazette of October 12th, 1910 commented on the “clockwork regularity” of the CPR steamships’ arrivals and departures in the Port of Montreal. In 1915, Canadian Pacific was renamed Canadian Pacific Ocean Services and publicly absorbed the Allan Line. The amalgamation of the two companies was completed in 1917. To immigrate to Canada, everyone from Great Britain before about 1950 arrived by ship, but our family members didn’t stop with that one west-bound voyage. Travel was a pleasure and each ocean voyage was a special and memorable occasion for the Shill/Bartholomew and Waddell families. The trip "home" to Britain was infrequent and consequently more special for it. Much of the following information was found on Ancestry.ca by searching their databases of passenger lists, particularly Canadian Passenger Lists, 1865-1935, and UK Incoming Passenger Lists, 1878-1960. John Shill, the father traveled on the S.S. Siberian arriving Halifax, February 10th, 1907. John Shill never returned to his homeland, England. To see a summary of the shipping news as presented in the Montreal Gazette the month John Shill arrived, click here. John (Jack) Shill Jr. embarked on the S.S. Lake Champlain from Liverpool arriving June 30th, 1907. He returned to England as a soldier during World War I on the Hesperian, departing August 17, 1915. He died in France. John Lee, the future husband of Marion Shill, arrived in Canada on the Empress of Ireland July 1907. The remaining Shill family members, Ellen Mary, May, Anne, Bert, Grace and Nell landed in Halifax April 6th, 1908 on the S.S. Kensington. Bert Shill traveled to England on the S.S. Andania as a soldier in World War I, not to return. Cara Shill voyaged to Canada in 1920 to see the family who had left England. She arrived in Halifax on the Canada on April 9, 1920. She departed from Halifax on the Grampian arriving in Southampton, England on July 4th, 1920. A number of photos were taken to commemorate her only trip to Canada to visit the family. Jim Waddell worked as a Steward on board the R.M.S. Pretorian in 1921 and landed in Canada in December of that year. Ellen Mary Bartholomew Shill took a trip to England in 1928 before Nell’s first son was born traveling outbound on the Montrose and returning to Canada on the same ship. Nell and Jim Waddell took the elder two children to England in 1930 traveling to Liverpool on the Circassia of the Anchor Line. Jim returned to Canada after a few weeks on the Empress of Scotland. Nell passed the summer in England with the children, returning home on the Empress of Australia. Marion H. W. Shill returned to England with her husband John (Jack) Lee arriving 22nd Aug 1935 at Southampton, England from Quebec on the Empress of Britain and crossed to Canada arriving in Quebec 27th of August on the Duchess of Richmond. Was it a vacation? Jim Waddell traveled to England and Scotland in 1936 with the Vimy Pilgrimage on the Montcalm and returned on the Duchess of York. Anne M.E. Shill traveled to England in 1951 at age 58 with The Cunard Steamship Company Ltd’s ship, Scythia, departing Quebec and arriving Southampton, England on the 24th of May, 1951. Thereafter they traveled by air.